Twitter. It’s a format that I’m a bit of a Johnny-newcomer too and to be honest I’m still finding my feet on it. There was no real reason why I ignored Twitter for so long other than I just didn’t see the need for it. Anyway, fellow blogger Jamie (@Whiskey_JAC) pestered me into signing up and I naturally caved into the incessant peer pressure. 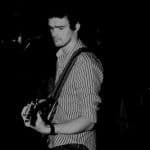 As it happens my timing was pretty good as not long after signing up I received a message from Joe Magowan, brand ambassador for Dillon Bass who look after Jameson, Redbreast and of course Powers. Joe invited me to participate in a live Twitter tasting with other enthusiasts and bloggers from around Ireland on May 16thto coincide with the upcoming World Whisky Day event a few days later. Details were exchanged and I awaited the tasting package. I have heard of Twitter tastings before but I was completely unaware of how they actually operated in reality, so I was pretty intrigued as to how the night would go and also who else would be involved. Fast forward a few weeks and the tasting package arrived. Included inside were five glass vials containing the core range of Powers. 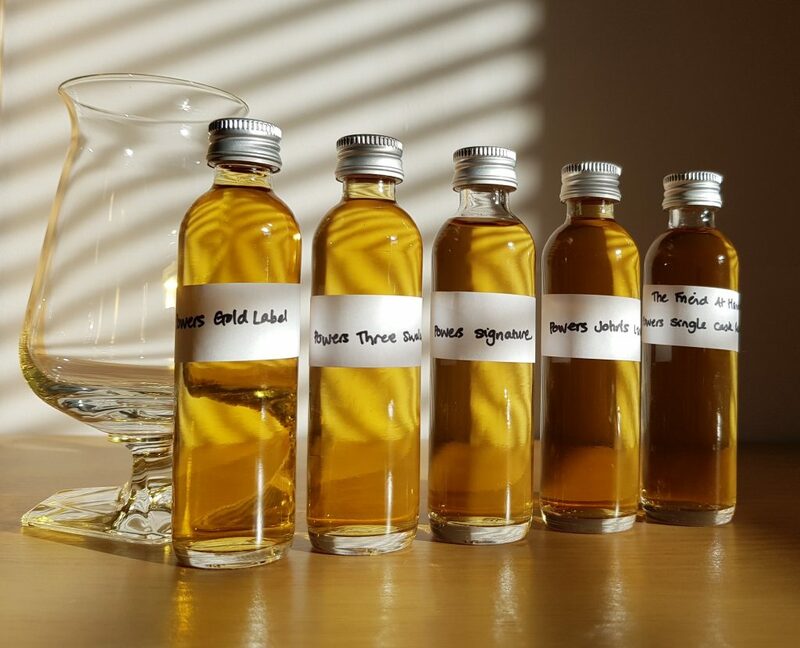 The Gold Label blend, Three Swallow Release, Signature Release and John’s Lane Release plus an added bonus of a 14 year old Single Cask Release bottled for The Friend At Hand in Belfast that I had had the pleasure of tasting on its release last November. You can read my thoughts on that particular release here. Also in the box were a Tuath glass and letter explaining the night’s running order. 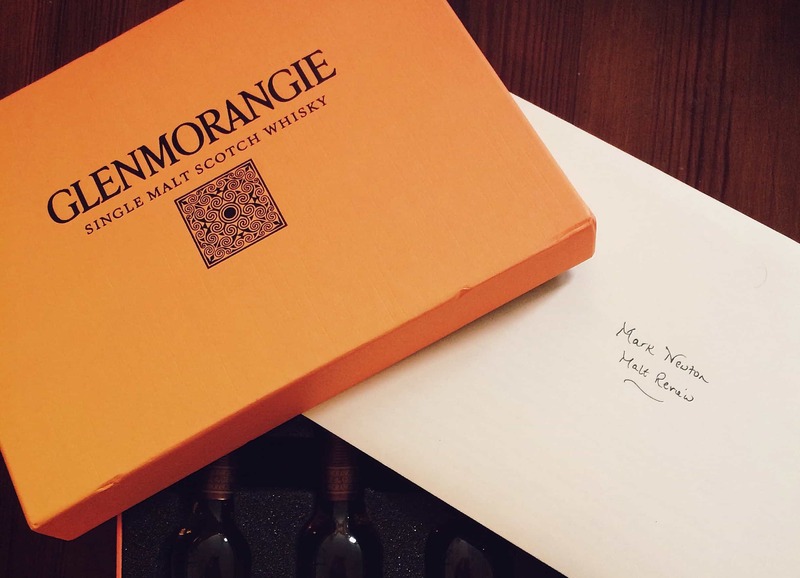 One thing that did strike me upon opening the box was that the colour of all the samples apart from the Single Cask were practically identical – please stop using colouring, Midleton, please! By 7pm on the night in question, I was primed with my samples pre-poured to let them breathe a bit and fingers at the ready to type furiously. I have to say that once underway it took me a little while to get to grips with proceedings, tweets flying left, right and centre, it was just a bit overwhelming. After the first expression was done I had found my feet and got into the groove. It was a really interesting experience to compare and contrast each others nosing and tasting notes on the fly and the craic was great with plenty of banter in between. It was this aspect that I enjoyed as much as the whiskey. So for those of you unfamiliar with the Powers brand, how about some history? James Power founded the original distillery in 1791 in Thomas Street in Dublin in his public house but by 1822 had moved to John’s Lane just off Thomas Street to allow for expansion, the distillery at this point having three pot stills. Expansion was fairly rapid and by the 1880’s they were producing over 900,00 gallons of spirit per year. At this time Powers was producing only pot still whiskey. In 1886 Powers became the first Irish distillery to bottle their own whiskey and, in fact, were one of the first distilleries in the world to do this. This allowed Powers quality control over their product in a time when distilleries were overwhelmingly still selling their wares to wine merchants and bonders who would the bottle it themselves. 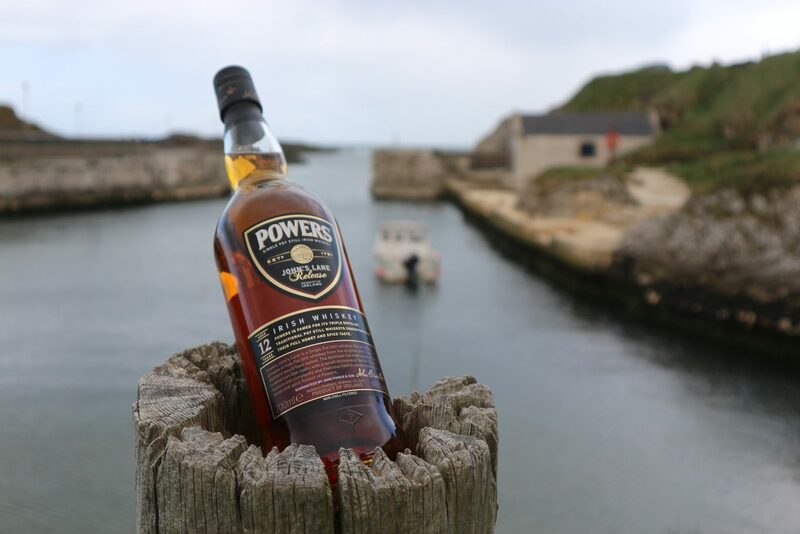 All bottles coming from Powers had a distinctive gold label and the Gold Label whiskey was born. If your Powers had a white label it had come from a bonder. 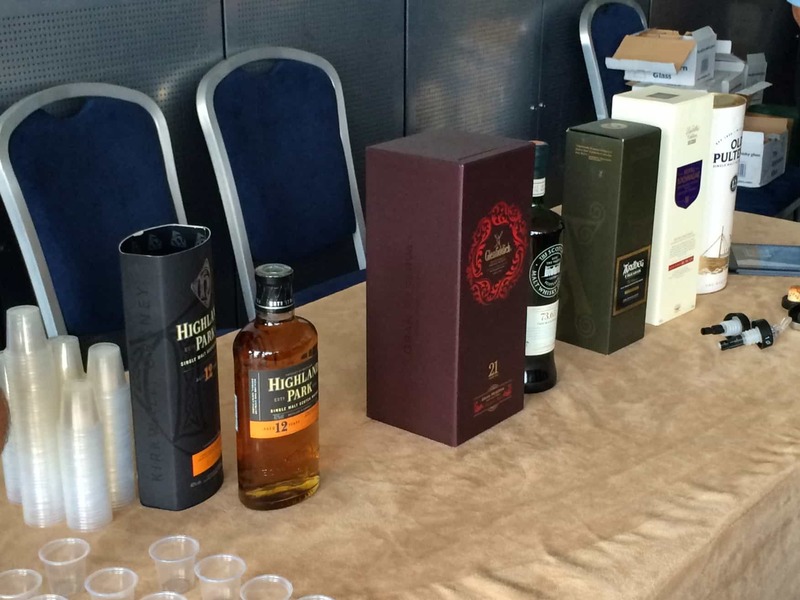 During the 1960’s Irish whiskey was in a rather pitiful state. The 1916 Easter Rising and subsequent War of Independence led to an Anglo-Irish trade war effectively ending Irish whiskey’s access to the British Empire’s world market. Prohibition in America closed off the other main market and the Irish whiskey industry went into free-fall, allowing Scotch to assert itself as the dominant player in the market. In 1966 Irish Distillers formed with Powers, Jameson and the Cork Distilleries Company banding together in an effort to consolidate their position. Not long after the decision was made to close their existing distilleries and move to New Midleton, a purpose-built site that would serve all. With the opening of New Midleton in 1975, production at John’s Lane ceased, plus Powers ceased to be a pot still whiskey – instead reformulating into a blend. Thankfully now with the renaissance of pot still whiskey kicked off by the relaunch of Redbreast 12 in the 1990’s, Irish Distillers saw fit to add single pot still whiskey into the Powers line-up, initially adding the John’s Lane release in 2011. A blend that is majority pot still whiskey mixed with a small amount of grain whiskey. It’s matured exclusively in ex-bourbon casks. It’s no age statement, but rumoured to be between 5 and 6 years old; it is bottled at 40%, is non-chill filtered but does use colouring. In Ireland, most supermarkets will sell this around £20-24. On the Nose: Apples, honey, vanilla, honeydew melon, oak char and pot still spice tempered by floral notes from the grain. In the mouth: Lively and fruity. Honey, apples and pears, some under-ripe banana. Cinnamon and clove make an appearance before the oak takes over and adds a dryness to proceedings. The finish is relatively short but warming with clove, honey and oak the overriding flavours. Pure pot still this time. A no age statement expression but is around 6 years old. Matured primarily in ex-bourbon refill barrels with a smattering of ex-sherry refill barrels. Again bottled at 40%, is non-chill filtered and uses colouring. This usually sells for between £32-35 per bottle. On the nose: The pot still spice is a bit more apparent now. The next wave brings bananas….lots of them. Cut white grapes, pineappleade and maybe a touch of cream soda. A little touch of vanilla. Not much from the sherry casks; quite spirity actually with nail polish in the background. In the mouth: What immediately strikes me is how thin this is in the mouth, thinner actually than the Gold Label. It has a gentle spice kick, white pepper and clove oil. A light nuttiness with some honey. Then it quickly turns green, green apple skins, herbaceous and ever so slightly tart and bitter. The finish lends a little oak and honey but disappears even quicker than the Gold Label. On the nose: This is altogether drier and spicier on the nose but underpinned with honey, vanilla, citrus oil, fig rolls and black pepper. Again green apples and honeydew melon eventually present themselves. In the mouth: Much oilier in the mouth, really mouth coasting and also much more of a spicy kick to this. The expected honey and vanilla from the bourbon casks come through, then black pepper warmth, cinnamon, nutmeg, coffee grounds, liquorice leading to a vermouth like a herb infusion and green apples. The finish is of medium length with coffee and oak and spice. At last an age statement! The youngest whiskey here is 12 years old. Maturation takes place mainly in 1stfill bourbon barrels, some refill bourbon and some ex-oloroso sherry casks. It is bottled at 46%, is non-chill filtered and yes you’ve guessed it, some colouring has been added. This retails around the £50 mark. On the nose: Much denser and earthier than the others. Powers has grown up. Old leather, rolling tobacco, butterscotch sauce, orange peel, chocolate and cask char. A lovely, decadent nose. In the mouth: Thick pot still oils coat the mouth, lovely texture. Orange oil, cinnamon, nutmeg, candied fruit peels. There’s a touch of sherry sweetness with raisins and almonds apparent. Caramel, fruit and nut chocolate. The dark chocolate notes grow with each mouthful. The finish is of lingering chocolate, coffee, honey and toasted oak. If you have made it this far then thanks for sticking with me! Okay, so the Powers Gold Label is probably my favourite Irish blend after Black Bush. It absolutely trounces Bushmills White (and definitely the Red), Jameson Original, Paddy and Tullamore Dew. Its uncomplicated for sure but the high pot still ratio is readily apparent and it’s just very good for its price point. The Three Swallow Release is a big disappointment for me. The nose promises a lot but the palate and in particular, the mouthfeel just doesn’t deliver. At over £10 more than the Gold Label blend, I find it hard to recommend. It tastes young and spirity, and the fact it uses refill casks as the predominant maturation vessel is easy to spot… they add little to the base spirit (I know this as I actually have some Powers new make at home). The Signature Release is a definite step up. The extra abv help lift the mouthfeel and the extra maturation is noticeable too. However, for me it is predominantly about the spice and so is a little unbalanced. Would I buy it again? Maybe. That possibly says it all. The Johns Lane though is where it is at for me in the Powers range. Dense, earthy and decadent. A belter of a pot still whiskey and if this was what the old Dublin style of whiskies was like when Ireland ruled the whiskey world I can see why it was so popular. I took the liberty of tasting this side by side with Redbreast 12 which is one of my favourite whiskies and incidentally, I also scored an 8 out of 10 like Mark did in his review, and for my palate, the John’s Lane just edges it. It just feels a little, and I mean a little, more mature but I am honestly splitting hairs. If you haven’t tried this then do yourself a favour and search a taoscán of it out! Thanks to Joe Magowan for the samples to participate in the Twitter Tasting. John’s Lane is for me an essential Irish whiskey, and definitely a value. Always on my shelf. Nice write up. I agree about the Three Swallows being thin – I was a bit disappointed with that one. John’s Lane is definitely a winner.